I was happy as could be the other afternoon...an all-day work meeting ironically titled "retreat" ended early (the real treat! ), the ATM at the bank was actually in operation, I dropped off my mail at a drive-by PO box, and returned some lights at Home Depot without incident. The next stop was to get my automobile emissions test which was due in a week. When I drove up to the emissions station, I found it was no longer in service. A wrench in my plans, but I still had time to kill before kid pick-up time. 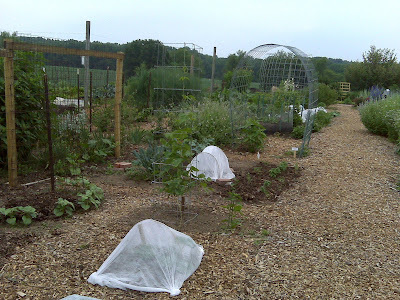 I realized I was very nearby the Montgomery County Master Gardeners' Demo Garden, and after reading via the Grow It, Eat It blog about all the interesting things the Montgomery County Master Gardeners are planting, I decided to search for this place. When I climbed the hill and entered through a most charming garden gate, I was awestruck at the hidden gem this garden is. Though "Demo Garden" isn't exactly the most clever name (and for some reason I always think of demolition rather than demonstration), it certainly is descriptive. This garden, one of the most obviously loved gardens I've seen, really demonstrates different vegetables, ornamentals, trellis systems, planting beds, paving materials, mulching strategies, and composting system. I'm not sure who exactly maintains this garden space, but it really looks like 20 very special little gardens in one large plot. Above: the expanse of the Demo Garden. Below: something I'd really like to try - attractive and space-saving. When I visited, I remembered that I wanted to come here and learn just before my first season gardening, and I really should have. A new gardener can read the educational signage, see how things are done, learn about how to grow veggies in a raised bed, and how much space to devote to certain vegetables (which would have helped me as you can read from this old reflection). 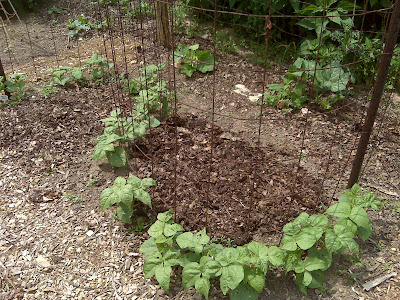 A more experienced gardener can learn about unique vegetables to try, gain ideas for trying something new, and even see in action, that colorful spiral trellis you've had your eye on. I, personally, am motivated to stop simply scattering my lettuce seeds, and grow in neat rows because it's just that much more attractive! 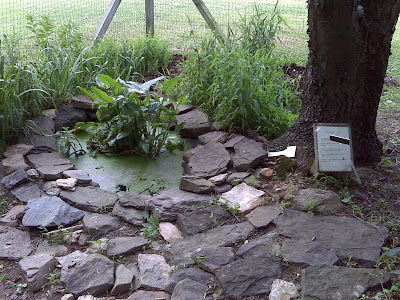 Above: a shade garden. Below: a fun reminder about the habits of mint! And the best part after this super-charged productive day that even got to include a garden visit...as I was taking this weird road home that I'd never travelled on, I happened to look left while sitting at a red light. Guess what I see? A small VEIP sign - an emissions testing center just around the corner! Alas, there was just one car in front of me. My trusty SUV passed with flying colors. Wendy: That does sound like a very productive day for you! This demo garden is awesome. It would have helped me in a big way if we can have such one near by. Oh, I also clicked your link to your "old reflection" post. I am very impressed by how organized you are, and being the true newbie myself, I do some research on the plants, but definetly not to the extent you took! Wendy, I really feel like such a failed gardener because my potted mint plant is always on the verge of death! Of course a little water might do it good, and I've had it loose in the ground so I know better than to let it loose. I think demonstration gardens are great places to get ideas, and perfect for educational groups like the Master Gardeners. Because they often look like a garden designed by committee, they don't always push my buttons as finished and complete garden spaces. But I tell myself that they're trying to do something altogether different. Nice garden to visit Wendy! Love the trellises shown. Looks like those pratical and economical DIY types which I would to know they built them. Wendy, I'm so glad you came! Sorry I didn't get to greet you and show you around - if you can ever come on a Thursday morning (now that school is out) please do! Thanks for the compliments - we are really proud of how everything's doing this year. 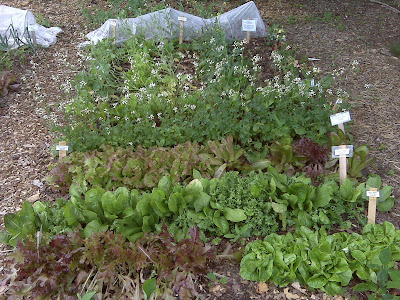 My post about visiting the demo garden is here - http://groweat.blogspot.com/2010/05/welcome-to-garden.html - everyone is welcome! Your stars were certainly aligned on that day. I would be tempted to buy a lottery ticket. 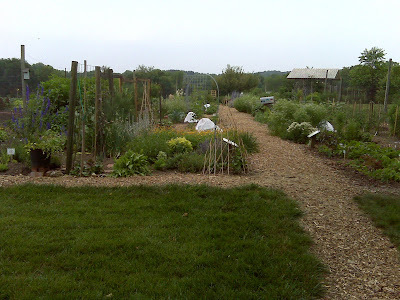 Oh, and FYI it's the demo garden of the Montgomery County MGs, not the whole state - other counties have their own! Stephanie, the trellises are made from cattle panels, which you can buy for $20 each at farm supply stores like Southern States. I will definitely try to make the rounds on a Thursday this summer! I did see your salsify and it's relative - the szor-something. Everything looked great! 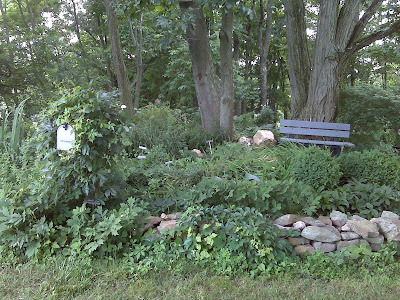 There's a similar set up in my area...a test garden of local master gardeners. A wonderful place to visit and learn. And from the looks of this one, it's well cared and maintained. 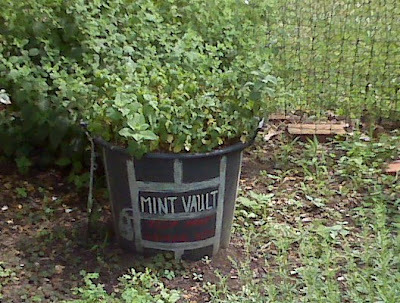 Haha...love the Mint vault...a good idea! I love demo gardens, I can always use another "why didn't I think of that" moment! I wish we have a place like Dems Garden in San Francisco so I can come and learn about gardening. I have to admit, I spent a lot of money and time buying plants, seeds, mulch, soil, and everthing else to get my garden growing but to have a failed garden in the end. Some of my hardy perennials and plants are doing ok now but all the others have met their untimely deaths. What a neat garden, and how inspirational to be able to walk through it! Glad you had a productive day, sounds like everything went as smoothly as it possibly could!